The unit enclosure in current generation units has been designed to allow for easy conversion to a rooftop-access unit instead of a car-interior access unit. Standard-order units are configured for access from the bottom inside the car, which is how the majority of heritage passenger car retrofit projects require the evaporator section. However, customers may order these units factory built to be accessed from the top, if the car is equipped with a roof access hatch. Our popular NW-BEOH-C air handler may be configured for access from a rooftop hatch, if requested at time of order. Twin Blowers are welded aluminum, and have an impeller design that will continue to put out the required air volume even if the ducting has fairly high air flow resistance. Blowers are of a similar type to those used in railroad air conditioning systems worldwide. Bearings are maintenance free. Blower wheels and motors are balanced at the manufacturer using highly specialized equipment so that the blowers operate without any detectable vibration. Depending on control system type and voltage requirements, the blowers may be ordered as multiple speed. This provides improved passenger comfort due to reduced air flow (less draft) and noise during periods where high volume air flow is not required. Options include 480 volt three phase three speed, 240 volt three phase three speed, and 120 volt single speed. Heater may be configured for up to 18 kW of electric heat, 480 volt or 240 volt three phase. Single phase versions may be produced upon special request. As seen below, the unit may be configured to have the blower output to either the sides or end of the unit by simply removing the various side panels. Thus, this unit is far more flexible (and in a somewhat smaller package!!) than our older NW-BEOH model. Air Conditioning Evaporator Coil designed to meet the needs of most standard single-level passenger cars. For dome cars and other types of cars that require greater capacity, two units may be used with the unit pictured here providing enough capacity for the lower level of the car. Air Conditioning Coil made of rugged, widely spaced fins that will not clog or break as easily as refrigeration coils that are designed for stationary use. All units have copper fins for long service life. Air Conditioning Coil has two evaporator circuits. This allows for variable evaporator capacity and various other control schemes. Four options are available for refrigerant pipe connections: left side, left air intake end, right side, and right air intake end. Our NW-100-CN condenser is sized to work extremely well with this unit. In some situations, two NW-64-CN condensers (one on each evaporator circuit) have been used in situations where more energy efficient variable capacity is desired or space requirements under the car demand two smaller condensers rather than one large one. An available option is a connector (shown at right) on the rear of the unit so that wiring to the terminal block inside the unit is not necessary. This makes installation of the system quite easy in terms of the wiring. 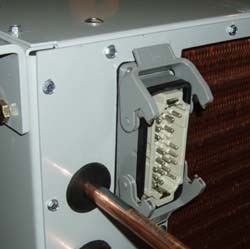 At this time, the connector is only available on the same side of the unit as the refrigeration pipe connections. Welded stainless steel evaporator drip pan. The drip pan is quite a bit deeper than what is found on most evaporators designed for stationary use, in order to meet the requirements of service on a passenger car not sitting on level track. The evaporator drip pan has multiple possible connection points, in order to provide good condensate draining even when the car is sitting on uneven track. Unit enclosure is powder coated. The standard color is ANSI 70 Gray, which is far easier to work with than black as it makes the interior much more visible. Since late 2012 most units come with vibration isolation kits as standard. Dimensions: 56 inches wide overall at support flanges. 52 inches wide for enclosure only. 31 inches deep (dimension parallel to air flow). 15 inches tall means the unit can fit into even more compact overhead situations than our standard unit. For an illustration of these dimensions, see the NW-BEOHC brochure available in our PDF Files area. Detailed drawings are available upon request. While the vast majority of passenger car rebuilds are able to use our NW-BEOH-C described here, there are some situations where customers require custom evaporators or condensers. If you think you may need a custom system, please take a look at some examples of custom HVAC equipment we have built over the years. The NW-BEOH-S heater and evaporator is designed for situations where the NW-BEOH-C would provide too much capacity. Examples include dining or kitchen areas, cars with two separate sections such as lounge and bedrooms, or the very small heritage coaches on some tourist railroads. Vertically arranged evaporator units for passenger cars where the most convenient interior space for installing heat and air conditioning is a closet shaped space. The NW-BEOH-CAB is intended for cooling even smaller areas. Various custom HVAC systems have been developed for a number of situations, such as evaporator systems that fit in the narrow closet of certain dome cars. Under-Car Condensers for those replacing or upgrading the entire railroad passenger car air conditioning system. Under-Car Diesel Generators for providing power to the HEP trainline.